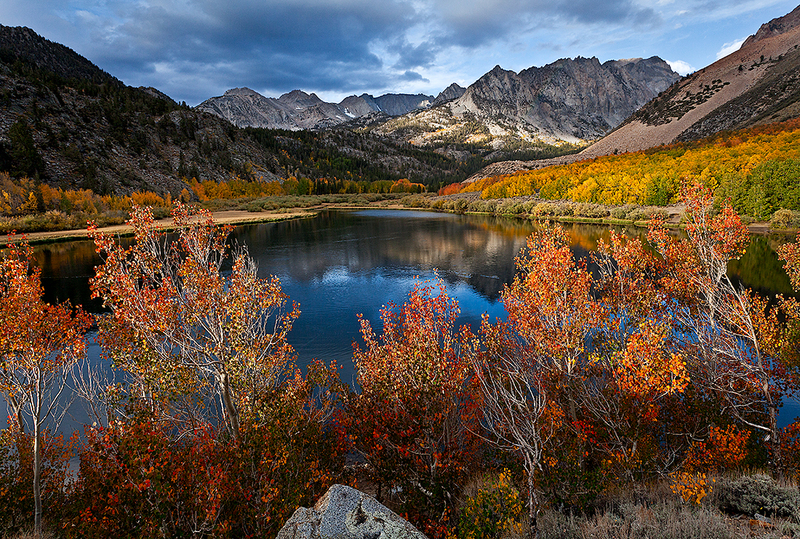 Autumn is magic in the Eastern Sierra! You will learn to make nature your palate through a mastery of composition in your mind's eye. The starting point of any great image is the moment of capture, but it doesn't end there. Good composition is necessary, but not sufficient for truly stunning images. The camera is an interpretative tool. You will learn to start with composition, capture it with a camera, then breathe life into it, creating the emotional impact you felt at that first impression. You will do that by deepening your understanding of Lightroom CC as an artistic rather than a purely technical tool. The end result is an image fit for a gallery or your wall. All participants agree that one of the best features of Vern's workshops is his unmatched knowledge of shooting locations amassed over four decades of living and wandering Eastern Sierra. Not only does he have an intimate knowledge of unknown locations of breathtaking beauty, but he has acquired an uncanny ability to predict the most spectacular light and color almost down the minute on any given day. He instinctively knows how to get to the best color using the most ideal light - even as the season progresses! Students often consider these workshops a "guiding service" to the best locations and then advance in their photography with the invaluable critique sessions! And this year, the New Moon aligns with our dates, and we will have one special evening reserved for night shooting. Although the workshop is designed for intermediate/advanced photographers, folks with less experience benefit greatly and are welcome. Vern will work with everyone in the field at their level, but information comes quickly in this workshop, and we will be moving at the group's pace. Level: All levels of experience. Our small class size allows personalized instruction. Focus: Classroom instruction, up to five shooting sessions in the field, critique sessions. Lightroom CC - learn the secret techniques that Vern uses to produce his own prints. Effort: Some hiking - the longest being 2.5 miles at high elevation of 10,000 feet. Location: Meet at Mammoth Lakes Gallery. Vern will select/guide 5 shooting locations from Rock Creek, Convict, McGee, Lee Vining, Lundy, and Bishop Creek Canyons. Included: Light breakfast daily; hearty lunch Fri/Sat; hot and cold beverages/snacks throughout. Not Included: Lodging (The Westin, Best Western, Motel 6), transportation to and from Mammoth, alcoholic beverages, dinners, anything not specifically listed as included. Questions: Call 760-934-5100 or email vern@vernclevenger.com. Workshop Requirements: Basic photography experience. Come ready to learn and have fun!!! Purchase of this course includes a syllabus containing course details and key concepts about digital photography. You will get the most out of this course by reading it prior to the workshop. When we meet on the first day we will check your gear, answer questions, and go over equipment basics. With cameras/tripods ready and questions answered, our first morning of Friday at a special selected near Mammoth. Then we gather for Vern's lecture exploring the key concept of his 40 year career embodied by the Antoine de Saint-Exupery quote, “It is only with the heart that one can see rightly; what is essential is invisible to the eye.” Then we will move on to exploring the "Visionary Wilderness" of photography as espoused by Galen Rowell. We will teach you to use your "right brain" to manifest your "inner vision." After lunch we will regroup at the gallery to load your images in Lightroom CC. This will give us the opportunity to critique your work and find your experience level with Lightroom. Less experienced students will receive more guidance while more experienced students can move at their own pace. When the magic hours of photography again beckon, we will rely on Vern's intimate knowledge of the area to find the best places to capture afternoon images. The pattern repeats itself on Saturday with more photography and visits to Vern's most select and more Lightroom. Sunday morning we will visit breathtaking locations using our new skills to capture your treasured autumn photographs. If the weather is good, we will visit a "Piece de Résistance" location. All Lightroom CC work will supervised so that each student will leave the workshop with satisfying and memorable images. Click on the pins to learn more about each location.